Moerenuma Park – Dig Delve – An online magazine about gardens, landscape, growing & making. 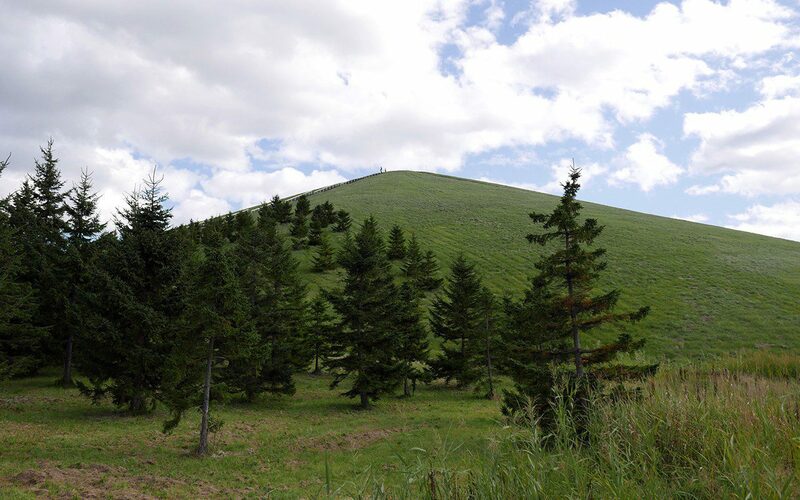 I have just returned from my annual visit to the Millennium Forest in Hokkaido. I have been making the journey back to Japan since the Meadow Garden was completed nine years ago and it is a privilege to be able to return to tune and evolve the planting. Each year my visits are timed to a slightly different week in the growing season. This year in the autumn to concentrate on a new layer of planting designed to extend the season to its limit. On my last day there a sharp wind from Siberia whipped over the mountains to toss the asters and the miscanthus and gave the mountain peaks their first showing of snow. The beginning of a winter that very soon will work its way into the garden to envelop it in a five-month eiderdown of whiteness. My visits have allowed me to build a bond with Midori Shintani, the more than capable head gardener. Without her the garden would not be possible and we are very lucky to be able to communicate and to discuss the nuances of the planting so easily. Through the garden we have become friends and, for the past few years, we have taken a few days after our annual workshops to visit other parts of Japan. 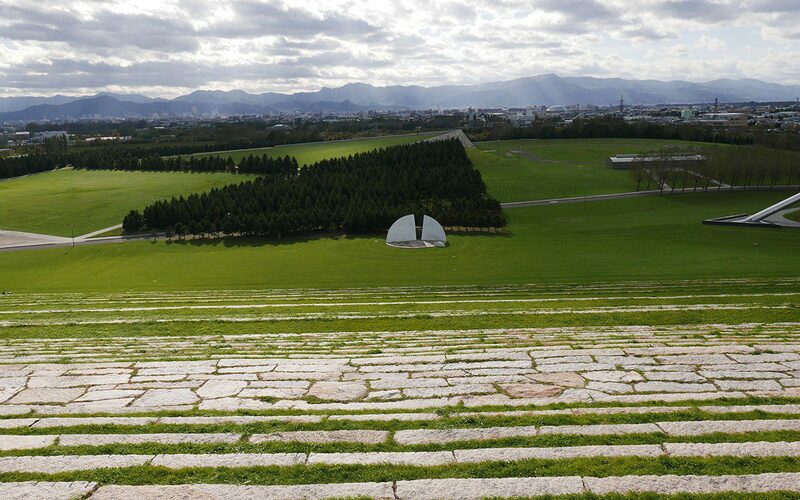 Last year it was to see the studio and garden of my great hero Isamu Noguchi on the island of Shikoku, but this year we stayed in Hokkaido, driving west to the capital, Sapporo, to see Moerenuma Park the sculptor’s last, and posthumous, work. 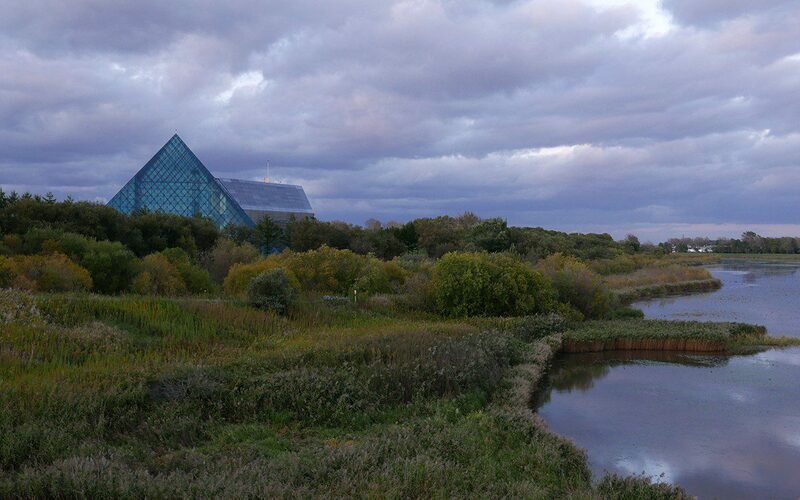 The construction of the site started in 1982 as a greenbelt initiative to convert a waste treatment plant into a place that people could use. 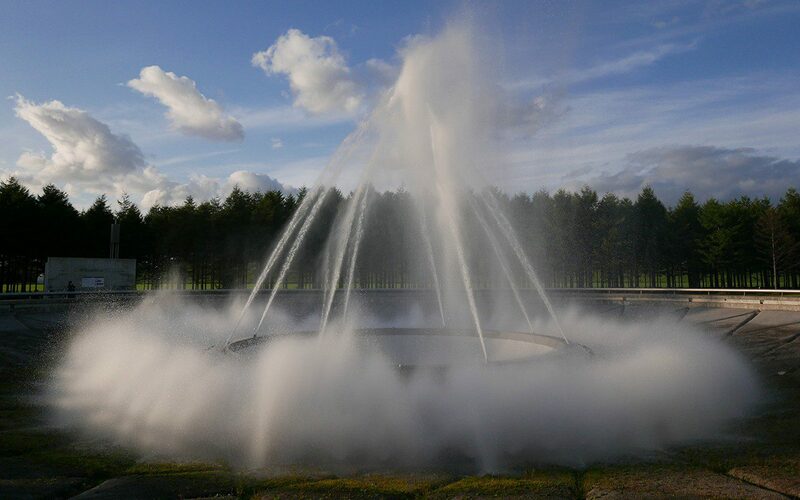 Nestled into a bend in the river on the outskirts of the city, the park now extends to 183 hectares and the completed landscape took a total of 23 years to build. 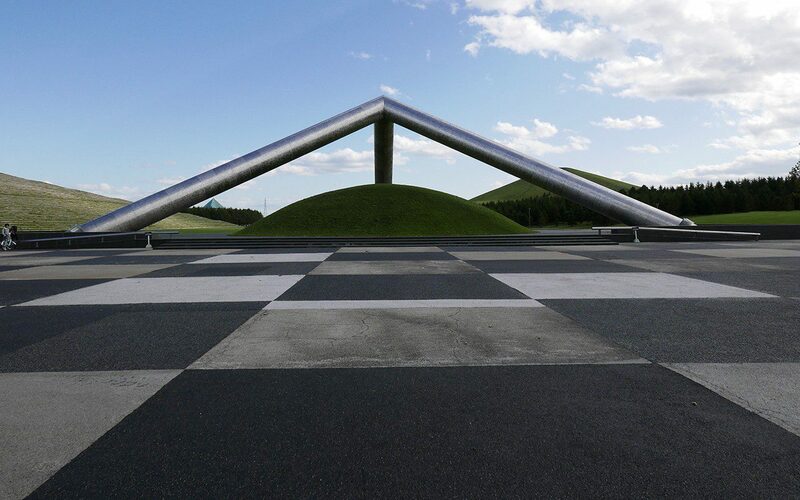 In 1988 Noguchi was approached by the city to design and masterplan the park. He first visited the site in July and presented his masterplan concept in the form of a three dimensional model in November. He died, aged 84, the same December. 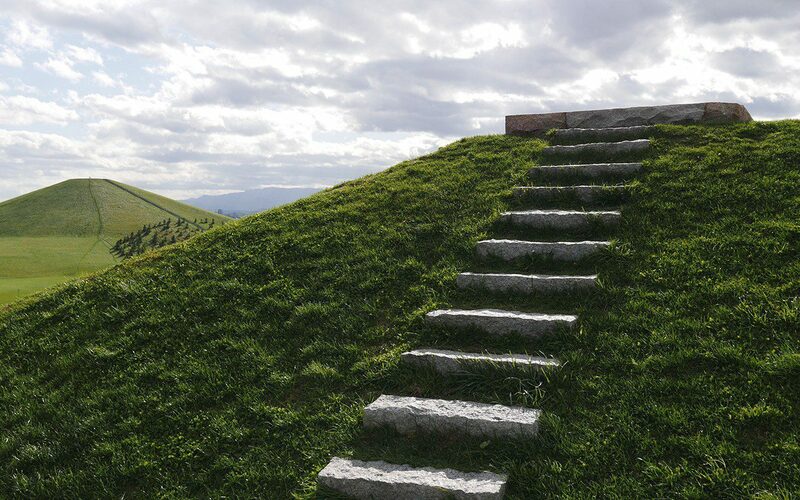 It is a testament to the city and to the Noguchi Foundation that the masterplan was followed so rigorously, for it is a hugely ambitious project. 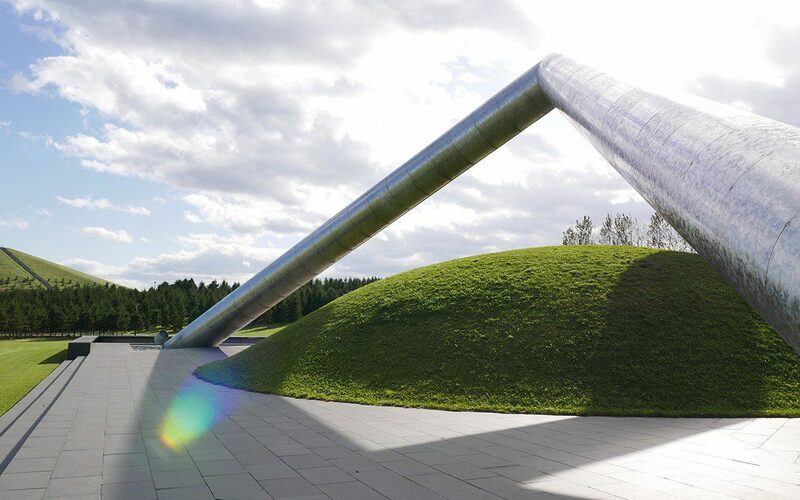 I first saw it – only two years after it’s soft opening – in the winter of 2000 under a thick blanket of snow, which completely abstracted the landscape through its unification. 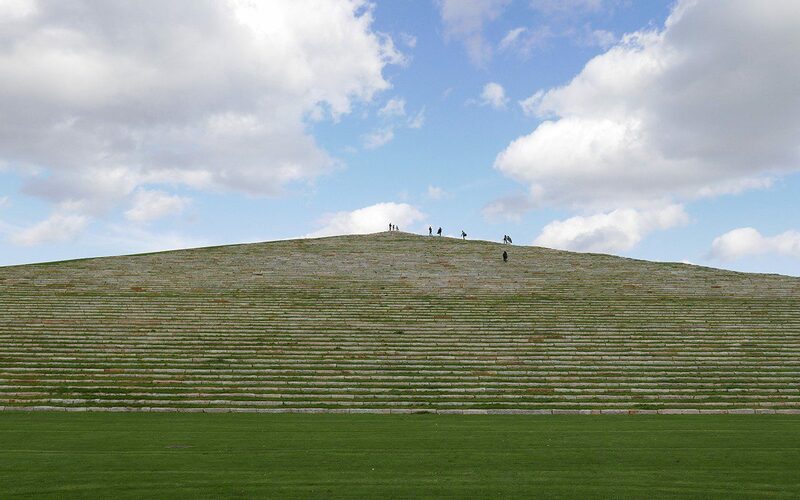 The genius of the place is that the landscape is considered to be one complete sculpture and, under snow, you could see it as such, like one of his tabletop maquettes or a piece of origami, the scale without the reference of detail, the boundaries apparently limitless. Returning to see it not only completed, but also green and still clothed in autumn, was no less surreal. It is a place that makes you feel very small and insignificant. 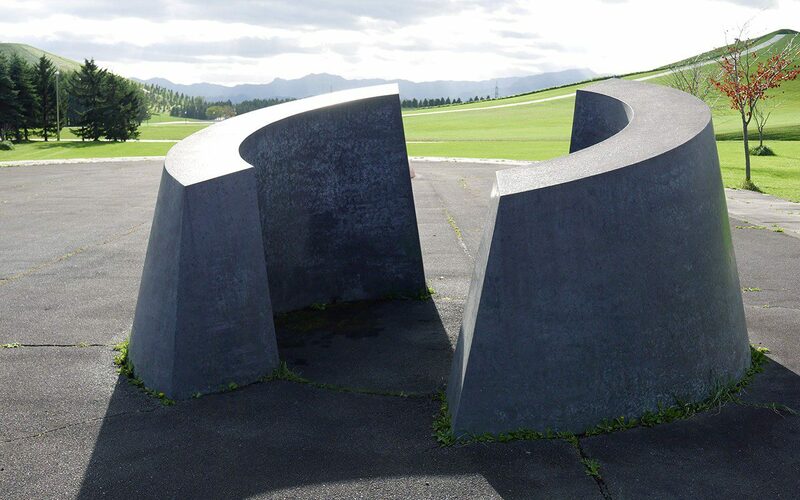 It has a monumental quality as if Noguchi had catalysed a life’s work into something that is bigger than man. Bigger than he ever was when he was living, like an exploded ego. And he is everywhere. As we walked the site (and not yet knowing that he had died in the year he had visualised this landscape) and it being autumn and empty of people, the mood was already melancholy. We talked about feelings of death, infinity and the beyond as we tried to grapple with the sheer scale of it. We found ourselves pining for the activity of people and the laughter of children that had always been seen as an essential part of Moere Beach, which was unfortunately drained of water for repairs. 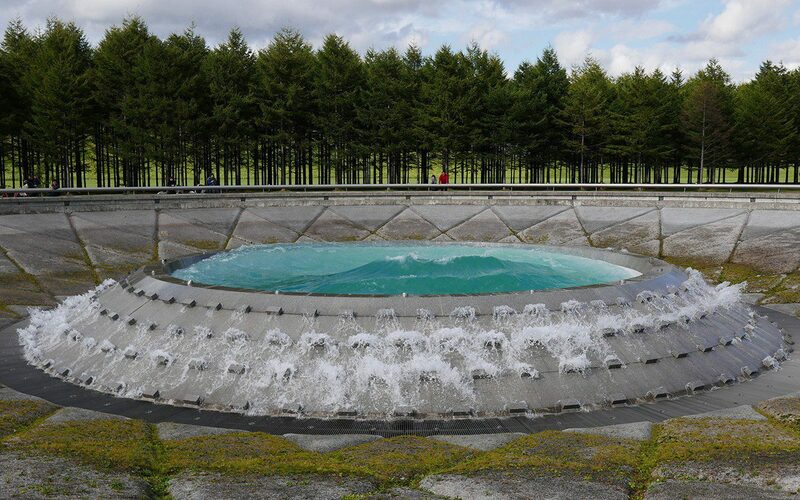 Noguchi had wanted to bring the sea to Sapporo and this shallow pond paved with coral represents a beautiful seashore which sits on the edge of The Forest of Cherry Trees. The great wrap of cherries would be the scene of parties spread out under the blossoming at hanami. 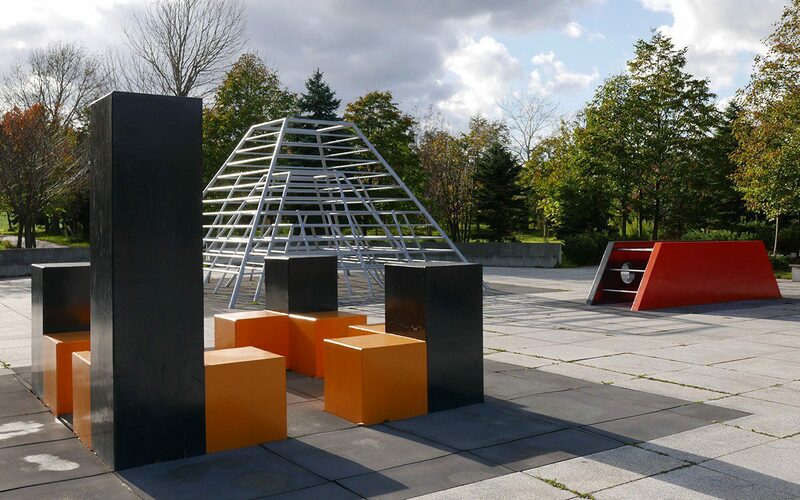 In the newly planted woods that wrap this extent of the site there are seven play areas which were designed so that, as the children lost interest in one game, they could move on to find another in the next clearing, animating the park as they went. 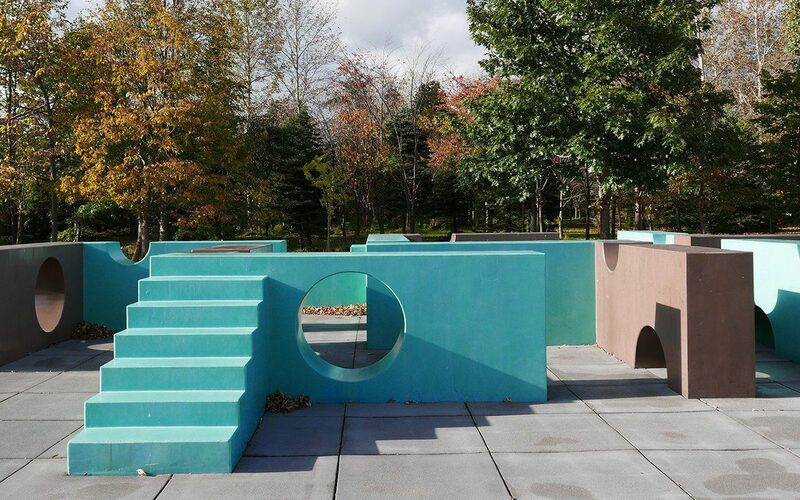 Noguchi designed the play equipment to stand alone as brightly coloured sculptures, so that it did not matter that we were there in silence. It was good to feel the scale of things amplified by the emptiness. 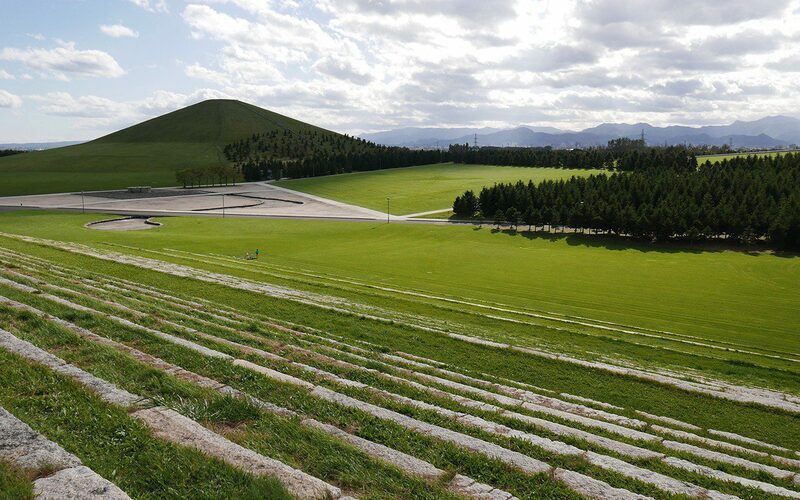 The park is dominated by two giant landforms. 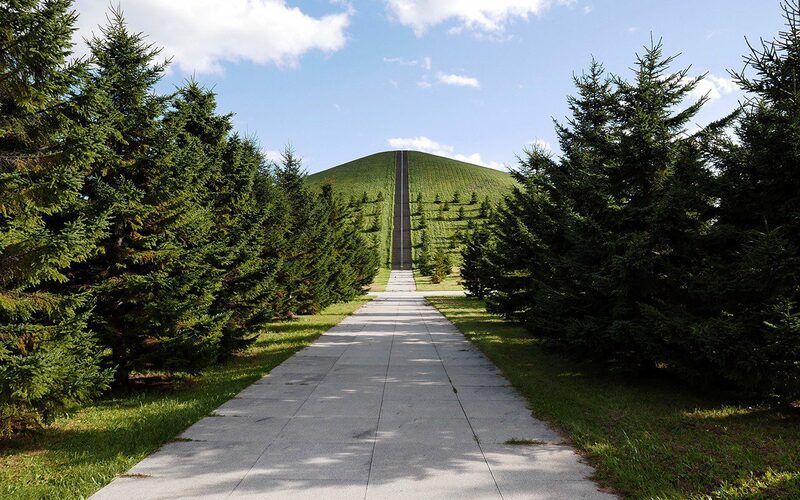 Mount Moere, a grass pyramid which rises to 62 metres, and the curiously named Play Mountain rising to 30 metres. Mount Moere brings a mountain into the city of Sapporo in another boldly elemental move. 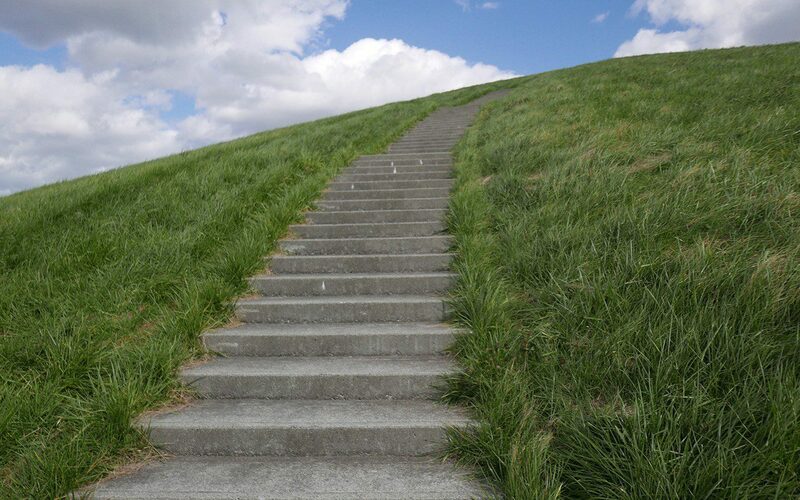 There is a direct route that stretches up in a perfect line to the summit and a beautifully drawn curve that allows you to traverse more gently, down a set of concrete steps on the other side. 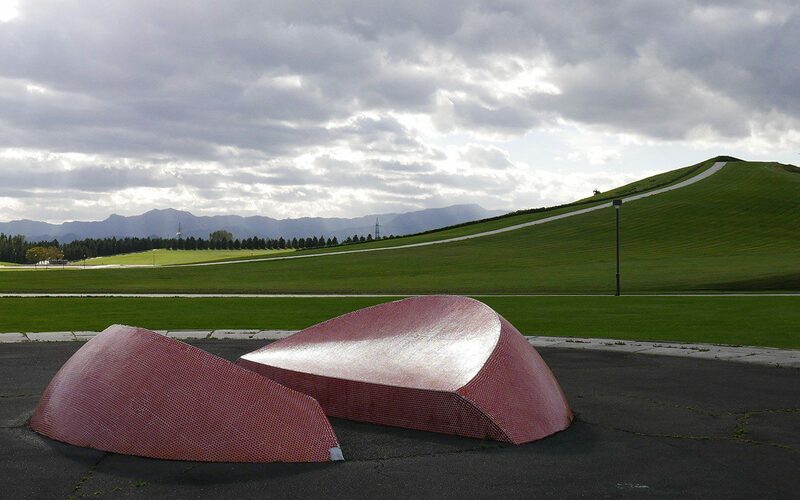 Though smaller, Play Mountain, which Noguchi first conceived in 1933 and contemplated over a long period, has a gravity and an ancient quality. 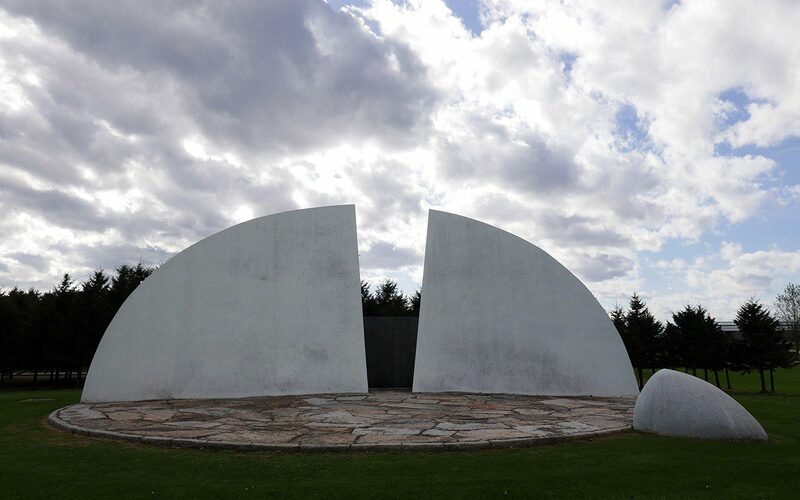 At its base, the whiteness of Music Shell has a back-drop of a bank of dark conifers, so that you naturally stand on the stage of the performance space and look up. 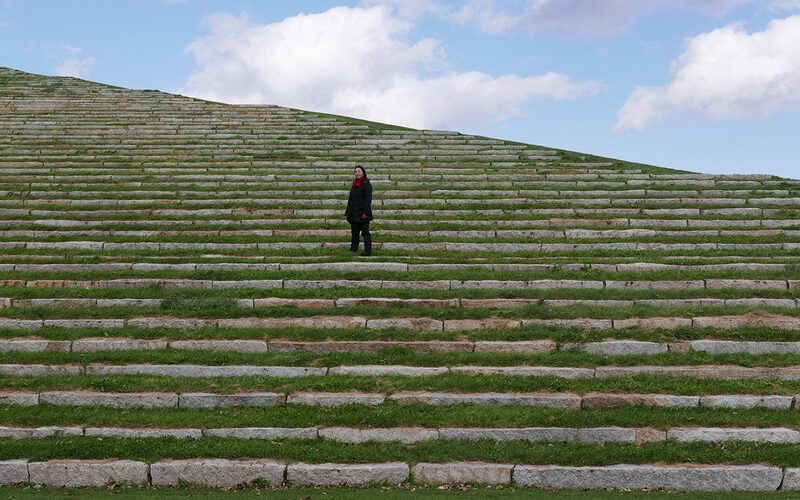 In front of you the mountain rises, one complete side stepped with granite sleepers. We joked as we ascended that it felt like we were on the way to a sacrifice. 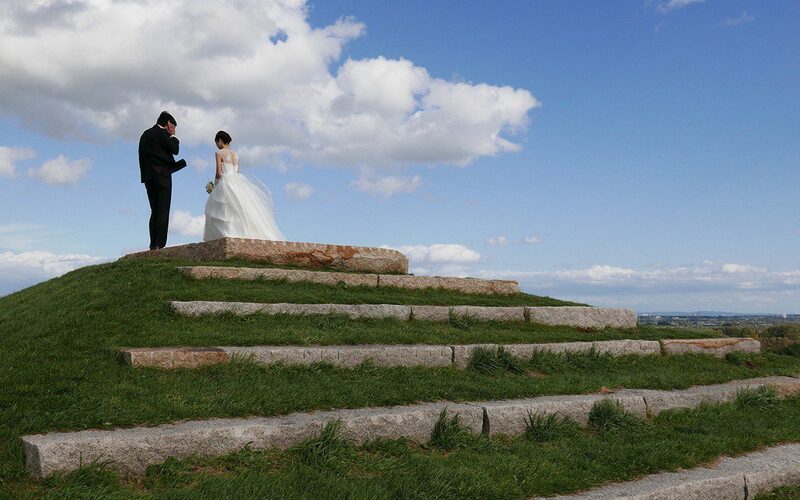 At the top (and only in Japan) a windswept bride and her groom were braving the elements for photographs. From the summit you look back to the conifer plantation which, it becomes clear, is helping the shakkei, (the borrowed view) by exactly echoing an outcrop in the mountain line in the distance. You then see the plantation is raised up on a great fold in the land with the angle of the crease retained by a wall the size of a castle rampart, also the same shape as the distant mountain. Below in the sunshine Tetra Mound glistens. 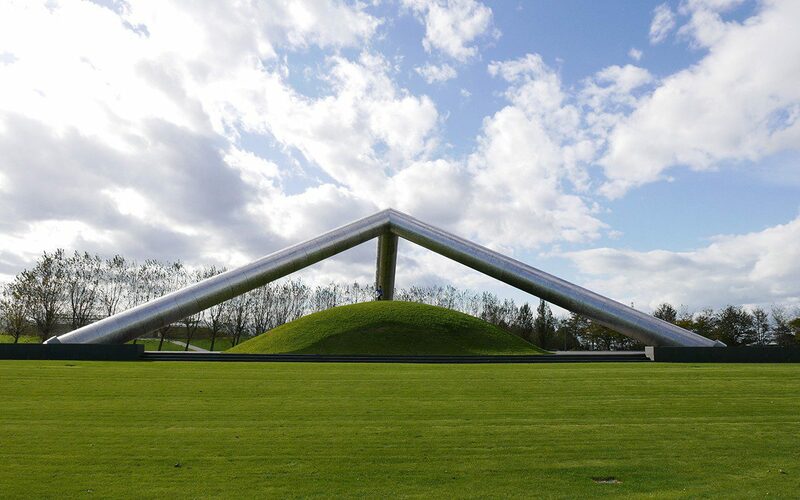 Composed of a triangular steel pyramid and grassy mound designed to capture different expressions with the changing light, it too is vast when you descend and cross the endless lawn to see it. 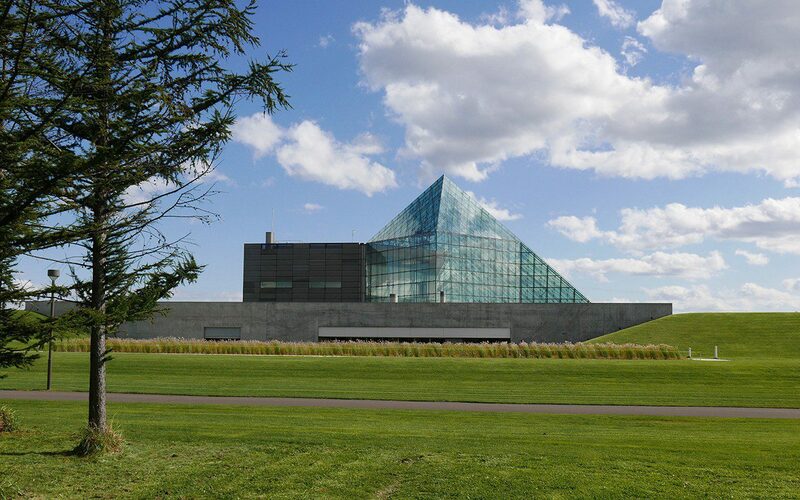 We moved on to the Glass Pyramid for tea and retreat. 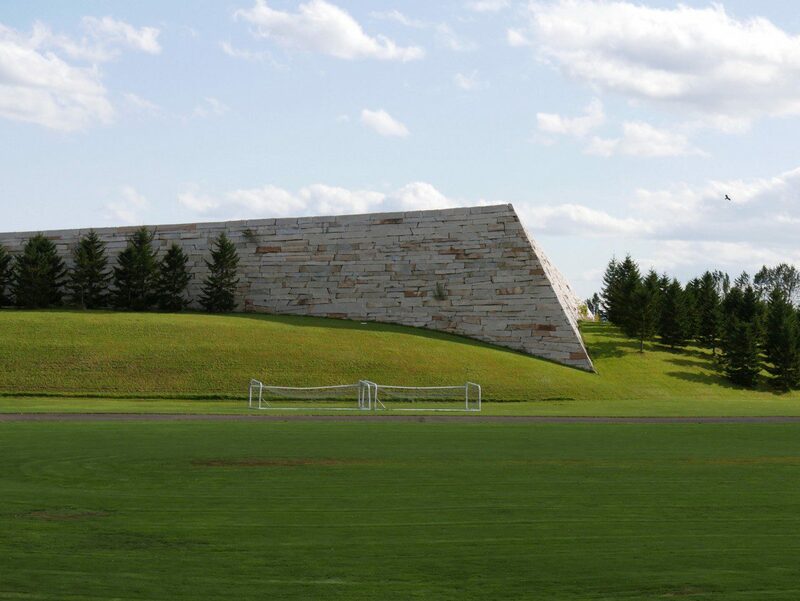 The pyramid, designed as Noguchi often did to contrast two materials, juxtaposes one opaque, the other transparent. 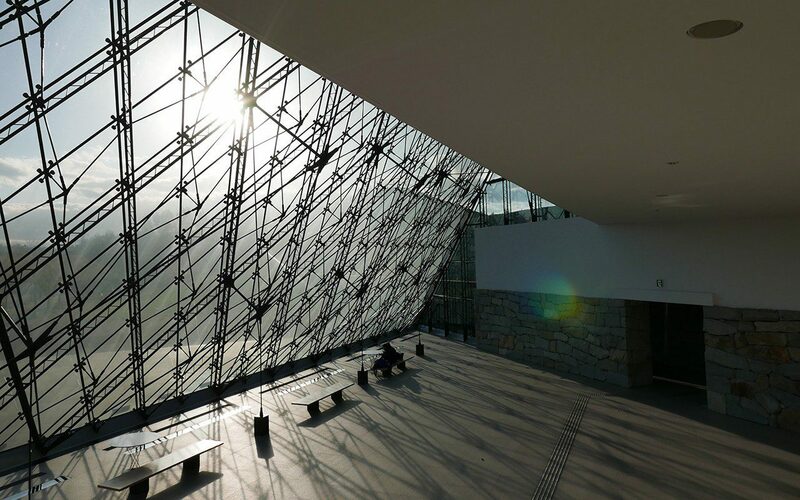 It was conceived as a hidamari, a word that describes the spot where sunlight gathers. Sure enough the sun streamed in through the glass and the enclosure of the place gave respite from the relentlessness of scale outside. Our feeling of being overwhelmed was charged as much with excitement as it was with awe, but I have rarely felt so uncomfortable or challenged in a man-made landscape. We finished the afternoon at the Sea Fountain. 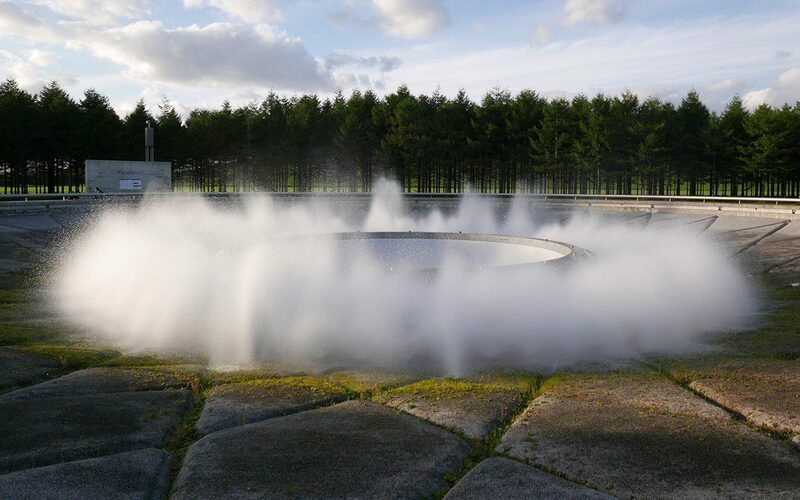 Held within a deep dark ring of conifers, the circular plaza centred on the last of Noguchi’s pieces to be completed at the park. He had long been fascinated by water as sculpture and birth, life and the heavens as inspiration. We arrived to find the vast cauldron boiling and churning like deep sea water when it is pushed into a ragged cliff. 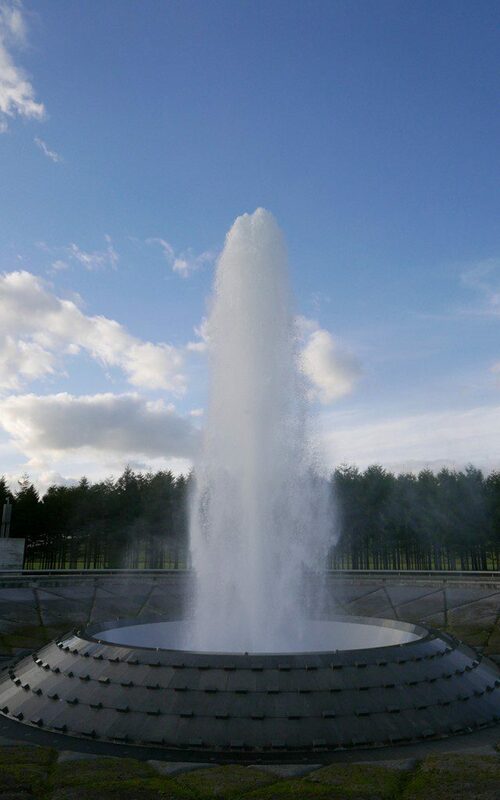 It was truly moving, the life we had been looking for and, then, joy as a halo of mist wrapped the crucible and then sent a geyser reaching way into the light to apparently connect with the clouds.